Fake news purveyors have repeatedly promoted tweets from a Twitter account that was run by Russian operatives, often framing their articles directly around the account. In September, Facebook announced that a Russian firm tied to the Kremlin, the Internet Research Agency, had bought at least $100,000 worth of advertisements on its platform during the 2016 election. 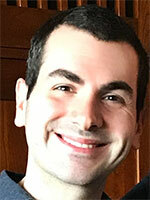 Later that month, Twitter announced that it had found at least 200 accounts linked to the same firm. 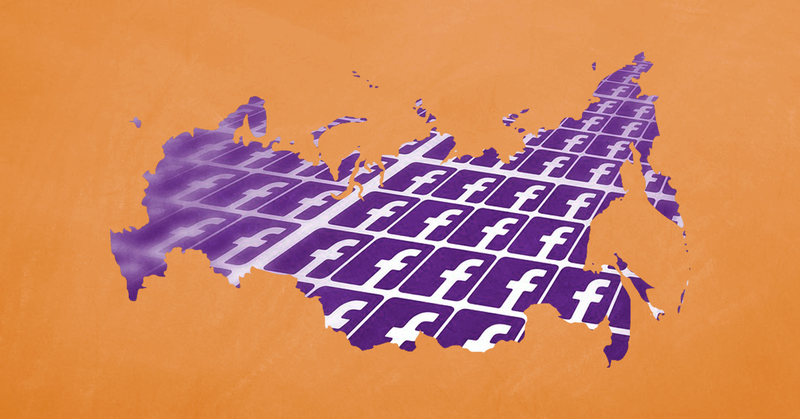 Several news outlets have also reported that Russian operatives used these social media platforms to push anti-immigration rhetoric, including organizing an anti-Muslim rally and impersonating a Muslim group to stir chaos in the U.S. In October, one of the Russian Twitter accounts was identified as @TEN_GOP, which had claimed to speak for the Tennessee Republican Party. The account previously had been repeatedly cited by media outlets, celebrities, and figures in Trump’s orbit. Websites known to purvey fake news also regularly cited the account, sometimes to push the same themes that Russian-affiliated accounts did on Facebook. 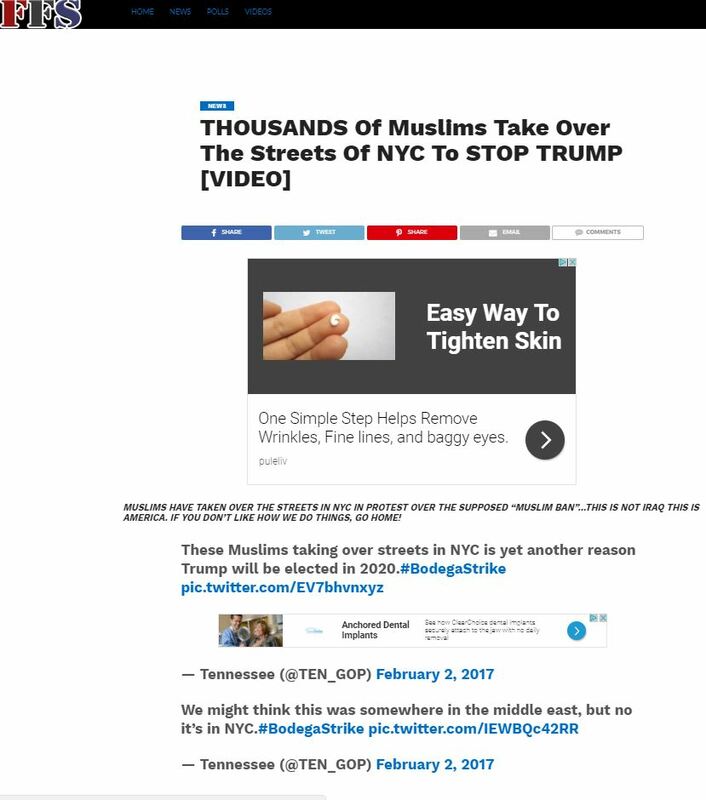 For example, multiple fake news purveyors in February wrote pieces about “angry filthy Muslims tak[ing] over streets of NYC,” citing a video posted by @TEN_GOP that claimed to show “Muslims taking over streets in NYC.” One of the fake news purveyors was The New York Evening, which is based in Macedonia, a major hub for fake news writers. One of those articles drew more than 23,000 Facebook engagements, according to social media analytics website BuzzSumo. 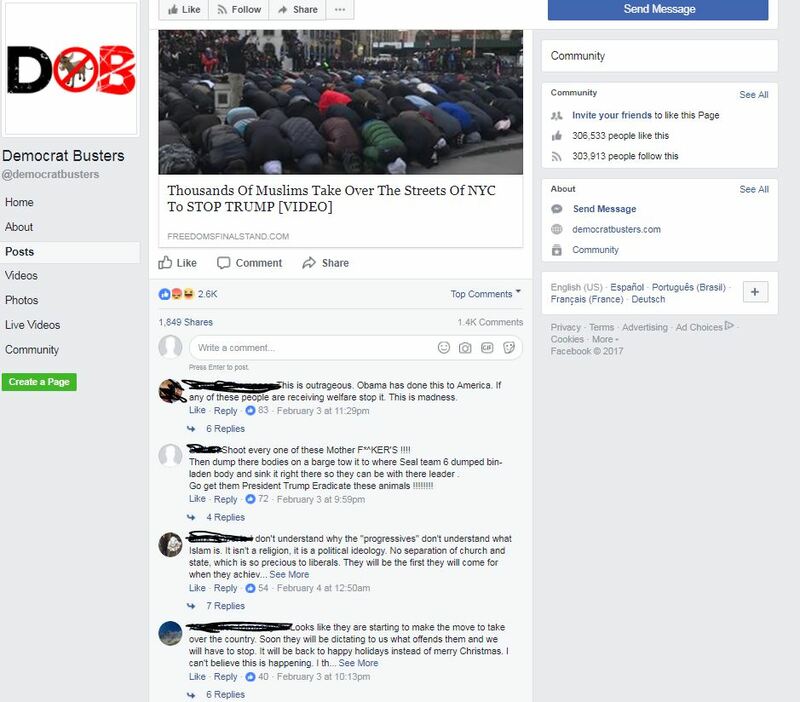 In turn, other Facebook pages shared those articles, with users claiming they showed that Muslims “are starting to make the move to take over the country” and that it was “more reason to ban them.” Other anti-Islam tweets from @TEN_GOP, such as those claiming a supposed riot in Paris justified Trump’s Muslim ban and attacking London’s Muslim mayor, were also written up by fake news purveyors and subsequently shared on multiple Facebook pages and on Twitter. Fake news purveyors also relied on @TEN_GOP for stories that pushed narratives they had already been promoting, such as attacks on mainstream outlets. Some of them cited the account to promote a supposed protest in front of CNN’s Atlanta headquarters -- so they could attack CNN as “fake news” -- and those articles in turn were shared on Facebook. Trump campaign digital director Brad Parscale also promoted the same rally on Twitter. Another fake news purveyor promoted the account’s claim that CNN removed a countdown clock chyron on the screen because it would help Trump, and another website featuring the same article was promoted on Reddit’s notorious “r/The_Donald” message board. That same claim was also pushed by Michael Flynn Jr., a former Trump aide and son of former national security advisor Michael Flynn. Fake news purveyors also promoted other @TEN_GOP attacks on CNN and MSNBC that were in turn shared and engaged with on social media by thousands. Hyped supposed voter fraud, a claim that Russia had incentive to push, according to security expert and former FBI agent Clinton Watts. Claimed there was another supposed riot in France. This one was picked up and pushed by Your News Wire, a fake news purveyor that experts have warned is a Russian proxy. Hyped and criticized the group antifa and said protests made Berkeley, CA, “look like the Middle East,” claims that were also promoted on Facebook pages and engaged with by thousands. Attacked perceived enemies of Trump, including Rep. Maxine Waters (D-CA), a staunch critic of Trump; former Secretary of State Hillary Clinton; House Minority Leader Nancy Pelosi (one of the Pelosi articles was later promoted by prominent preacher Rodney Howard-Browne); and former FBI Director James Comey. One of the fake news purveyors, TruthFeed, even cited the account to deny that Comey proved any collusion between Russia and Trump's campaign. These fake news purveyors' articles that cited @TEN_GOP combined had at least 330,000 Facebook engagements, according to BuzzSumo. TruthFeed articles citing @TEN_GOP were also frequently pushed on Twitter by two pro-Trump handles, @3lectric5heep and @ThePatriot143. The handles have over 96,000 and 119,000 followers, respectively, and suspiciously high activity. Most of the TruthFeed articles that cited @TEN_GOP were also tweeted by a network of at least 28 handles operating through the automation platform dlvr.it. FBI agent Watts told The Daily Beast that Trump aides’ promotion of @TEN_GOP demonstrates that Russia’s efforts to push propaganda through social media works, “because Americans will use it against other Americans.” It’s clear that people are doing the same with Russian messaging pushed by hyperpartisan fake news purveyors, sharing and reacting to these articles on social media. Thanks to disguised accounts like @TEN_GOP feeding into narratives that these fake news websites support, Russia has been able to interfere in American domestic affairs and further polarize the country.